InterCHARM the largest in Eastern & Central Europe trendsetting exhibition for cosmetics & perfumery expands the beauty bounds by opening a JEWELRY section on October 28-31 at Crocus Expo exhibition complex, Moscow. The new section is geared to reflect tendencies in the jewelry industry, acquaint vast exhibition audience with jewelry brands and boost domestic and international jewelry manufacturers providing with extended communication tools at the global beauty event. Jewelry has always been in close connection with beauty industry. Such honorable names as Cartier and Van Clef & Arpels are famous not only by their jewelry collections but also successful perfumes. Even in the circumstances of the global crisis InterCHARM keeps the position an efficient and developed business communication model consolidating related markets to offer multiple opportunities for searching new ideas and solutions for brands promotion, enforcing clients and partners relations, discovering new target markets and establishing dialogue with consumers. InterCHARM is a genuine beauty festival for over 15 years attracting thousands of people – from beauty professionals and experts of the industry to end consumers, who apart from enjoying perfumery and cosmetic novelties take the chance of participating in on-going beauty shows, work-shops, master classes and championships taking place at the expo. The Jewelry section of the exhibition will become a valuable complement to this festival, opening gates to the world of jewelry for over 70 000 expo visitors from all over the globe. Since 1994 InterCHARM has been making the case for trade fair as a launch pad for small and medium-sized enterprises as well as new and innovative products. It has become the best and most prestigious platform for beauty market players from Eastern and Central Europe, and all those interested in the region as well as focal point in development of a company, brands and individuals. The largest show in the area allows launching new product, overcoming objections, generating immediate sales and doing all that cost-effectively. As a result over 1400 companies from 38 countries and more than 130 000 specialists from 50 countries became InterCHARM clients. Last year InterCHARM welcomed 884 exhibitors on 19 750 sqm net area. The event gathered 76 000 industry professionals from all over the world, including the main decision-makers and opinion leaders of the industry, politicians, first-rate businessmen and stars. 334 companies from 30 countries (Belgium, Belorussia, Brazil, Bulgaria, China, Czech Republic, Finland, France, Germany, Hungary, India, Italy, Japan, Latvia, Lithuania, Moldavia, Pakistan, Poland, Singapore, South Korea, Spain, Sweden, Switzerland, Taiwan, Thailand, Turkey, UAE, UK, Ukraine, USA) presented their products and services to potential clients in Russia. Governments and official bodies of many European countries for many years support participation of their national industries in InterCHARM as it is one of the most effective platforms to do business in Eastern Europe. According to the poll, 95% of visitors and 78% of exhibitors were happy with the results of the exhibition. Over 60% of InterCHARM visitors make purchasing there. The major target group of the expo – cosmetologists, stylists, hairdressers, beauty business owners – are the opinion leaders in the modern society, whose recommendations are appreciated and followed. And of course along with perfumery and cosmetics they stimulate sales of jewelry brands as an integral part of the world of beauty. InterCHARM is the most significant beauty industry event in Russia, Eastern Europe and CIS countries. World-famous companies, manufacturers and distributors became regular participants of the exhibition. Millions of consumers repute InterCHARM as the trade fair offering perfumery and cosmetic products of the highest ‘professional’ quality. Thanks to this fact participation in InterCHARM grants exhibitors with so-called ‘quality proof’ for their products and services, and jewelry manufacturers are welcome to share and benefit from this global brand image. InterCHARM is managed by Reed Exhibitions – a renowned professional trade-fair organizer, operated in Russia by Reed-SK, which strives to make the emerging Russian and Eastern European market more transparent for foreign companies and their presence here more efficient. This becomes possible due to comprehensive knowledge of the industry and unbeatable expertise in trade show running. Reed Exhibitions excels creating high profile, highly targeted business and consumer exhibitions and events to establish and maintain business relations, and generate new business. Every year the company runs over 500 events in 38 countries, bringing together over 6 mln active event participants worldwide. Its network of offices and promoters extends to 65 countries and serves 44 industries worldwide and provides support to exhibitors in export markets. InterCHARM is an example of a highly effective model of business communication. Each participant of the exhibition is provided with the utmost business communication tools. Comprehensible segmentation and navigation system where every section is marked with a unique sign and color, professional approach at clients’ attraction and retention, etc. – all these tools strengthen beneficial properties of the show. Every year the show organizers develop new effective methods of collaboration that rates InterCHARM among the best-organized events in the world. InterCHARM has partners in Germany, France, Great Britain, Spain, Italy, China, South Korea, Poland, Thailand, Taiwan, Singapore, Turkey, and Hungary. Governments and official bodies of many European countries for many years support participation of their national industries in InterCHARM as it is one of the most effective platforms to do business in Eastern Europe. The concurrent program of the exhibition includes Doing business in Russia complimentary seminar geared to be the main source of key information for foreign market players that spotlights such topics as: Russian beauty market in facts & figures, consumers profile and their preferences, peculiarities of entering Russian regions and CIS countries, distribution system: how to avoid risks and get a success, and much more. 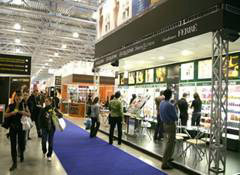 The exhibition is held under support of Moscow Government, Chamber of Commerce and Industry of Russia and Perfumery and Cosmetics Association of Russia. InterCHARM – is the first beauty industry event awarded with UFI. We were very pleased with the exhibition; everything was very well-organized as always. If before the exhibition was a link between retail and well-known brands, now many companies present more of the new brands which are not on the shelves yet. It’s good that the number of the Russian brands is also increasing. For us InterCHARM is one of the substantial exhibitions in Eastern Europe. It remains the key platform for taking significant business decisions. Nearly all the time we were occupied with meetings and negotiations with our partners. The exhibition illustrated the tendency for prevailing of natural and organic products; it dominates in all the segments - from packaging to product textures and odorants. InterCHARM-2008 brought together thousands of people, specialists of the beauty industry. We would like to find partners and distributors here. It is one of the largest expos in Eastern Europe, where lots of companies from Russia, Europe, Asia and CIS exhibit their products. Russian cosmetics market is growing fast; this is why it is of a great interest to foreign players. We are happy to know that Russians care about their health and beauty, and are eager for new products and innovations. First of all I’d like to mention that we were well surprised by the exhibition size and the number of participants. It’s pleasant and convenient to see the exhibitors divided into the specific zones according to the market trends – innovations, novelties, professional cosmetics, raw materials, accessories, etc. We are new to the market, so we participated in such a great event for the first time, and we would like to thank the organizers for their attitude towards the “newcomers”. InterCHARM-2008 became an ideal business platform for discussing a lot of important issues with the suppliers. Also we would like to thank InterCHARM for boosting us with its famous Gold medal award.